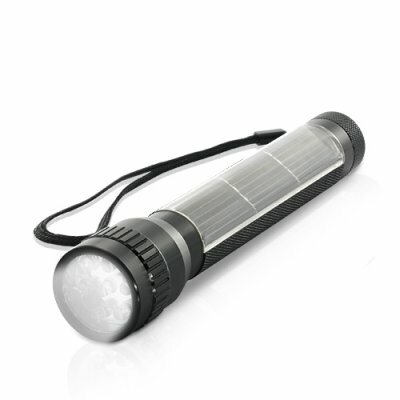 Successfully Added Solar Powered LED Flashlight to your Shopping Cart. A solar powered LED flashlight with rugged cast aluminum case for all-weather illumination whether you're ushering movie watchers or tomb raiding with Angelina Jolie! Our new solar LED flashlight will light up your world like never before. Who needs batteries when you have a solar powered LED torch light? Simply let it recharge in sunlight or a brightly lit room and you're good for endless exploration every time! Durably constructed, this weatherproof designed Solar Powered Flashlight is your ticket to adventures on or off the beaten path. It emanates bright white light and you can even use it as a weapon to fight off robot zombie pirates! Orders your today and we'll ship it out tomorrow - from the leader in wholesale online electronics and the dropshipping hub of the world, Chinavasion! Uses a ON/OFF click button at the base of the unit. Is this flashlight a narrow beam or standard beam type? This a standard beam type for general area illumination. on 2011-12-16 08:00:51 Number one with good product. Excellent and trustworthy to do bussiness with.merry xmas to all chinavasion team.